You've launched the idea and you're seeing a significant amount of new customers, but why in the world are you not hitting your income goals? Creating a product that your audience may actually need, is typically not the issue many of us creatives face. 9 times out of 10, we're not seeing our desired financial results because we are simply undervaluing and underpricing our work. Let's face it, yes you may love what you do, but you're also running a business which means it's imperative that you make enough money to keep your business afloat, pay your team and actually pay yourself. When I first started coaching, I allowed the fear of charging too much and potentially turning off customers to hold me back from setting firm prices. For a 60min, one-on-one coaching session, I charged $35. At that rate, I would have had to hold 100 coaching sessions each month in order to reach half of what I needed to bring in. While I did have more time than most people, coaching 100 women every single month was not only unrealistic but it would have burnt me out within 2 weeks. Undervaluing and underpricing your work won't do anything but cause you more stress and frustration in your business. So instead of charging less and taking on more clients, I decided to charge more and take on less clients. This way, I could really focus on each client and provide them with the time, attention and resources they need AND I could also have the freedom I desired which was one of the main reasons I became an entrepreneur. Undervaluing and underpricing your work won't do anything but cause you more stress and frustration in your business. In this quick guide I'm going to show you a simple way to set prices for both your products and services that will actually help you to hit your big money goals. How much are my average monthly business expenses? This includes: website maintenance, systems and tools, subscriptions, employees, etc. How much do I need to make to cover my personal bills? This includes: rent/mortgage, car payment, utilities, groceries, etc. How much "buffer money" do I want to make? "Buffer money" is considered extra money for things like vacations, savings, etc. You don't ever want to make just enough to cover bills. You want to set a goal that gives you a little extra to have fun, treat yourself or store away in savings each month. For example, If I know I only need $3000 per month to cover my responsibilities, I set my income goal to $5000. If you are someone who sells physical products, then you need to make sure you're setting both wholesale and retail prices that will help you to hit your goals each month. Here's an easy way to calculate. Take how much your materials cost or how much it cost you to get the product made. If you make your products by hand, add the cost of materials by your hourly rate. To get the wholesale price, multiply that total number by 2. To get your retail price, multiply that total number by 3. Adjust based on your industry. If you create and sell bracelets and most shops sell similar bracelets for more. Then, adjust your prices to fall in line with your industry. You don't want to over price too much (unless you can prove the extra value) and you don't want to underprice (cheaper isn't always seen as a good thing). Example: If the materials for my product costs roughly $8.50, it takes me two hours to create one product and I pay myself $15/hr, that's $38.50. To get my wholesale price, I multiple that total by 2. So my wholesale price would be $77. To get your retail price, multiple the original total by 3. My retail price would be $115.50. Again, depending on the product you are selling, you may need to slightly adjust the price. And if you're unsure how much you should be charging yourself hourly, base it on what you currently make at your job (if applicable). For service providers (ex: coaches, web designers, etc. ), pricing can be a little tricky because you don't have any solid numbers to base it on and you're pricing based on value and time. Some will tell you to price hourly, but I feel that can often be the quickest way to undervalue yourself and second guess your numbers. So for services I like to set a set rate based on what I need to make, which is why we got clear on our numbers. How much do you need to make from this service. If you offer any other products or services then your income is coming from multiple places, base your rate on how much you want to make from this specific service. If this service is your only offering, then you need to make enough to cover all of your expenses. How many clients are you realistically able to handle each month, quarter, etc. If you're still working a full-time job or have other responsibilities that take up your time, then you have to be realistic and ask yourself how many clients you are able to take on. The last thing you want to do, is take money from 8 people if you're only able to handle 4. Divide how much you need to make by how many clients you are able to take on. Example: If I need to make $5,000 per month and I can only take on 4 clients, then I would charge $1250 for my service. If you work with clients in 3 month packages and you need to make $15,000 to hit your income goal each month, then you would charge clients $3,750. 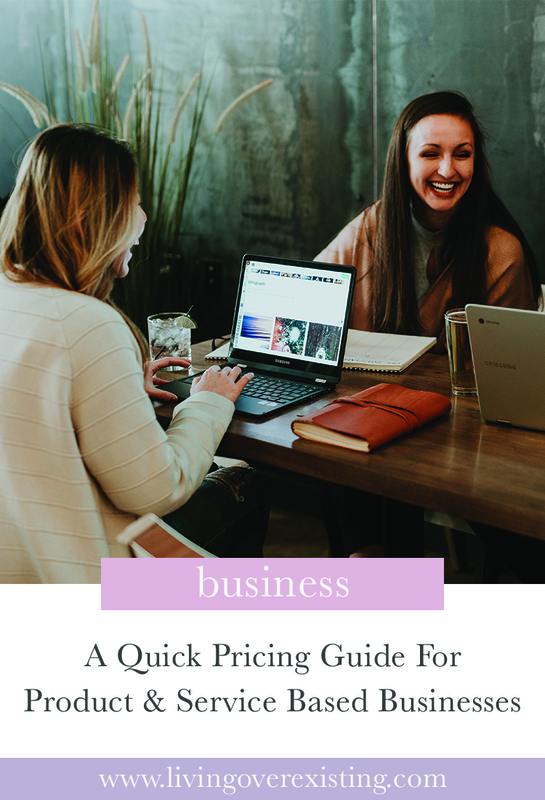 The ultimate goal when it comes to pricing is making sure that you are ultimately making enough to sustain you and your business. Now that you have an understanding of how to begin setting solid prices, I encourage you to go back through your current products or services to see if what you're offering makes sense. If you find that you're off, adjust as needed. Also note, you don't have to make dramatic changes quickly. I definitely didn't go from charging $35 to $1600 over night, but I did continue to add value to my services and got clear on exactly how my audience would benefit from working with me to justify the price increases as they happened.